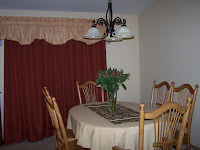 Here are the finished products for Lois' Living Room/Dining Room. Cinnamon full length drapery panels are layered under the piped valance. I think the contrast is very nice with the light wall color. 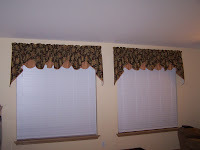 Also shown are the valances hung on the two living room windows. I'm recommending beige or wood blinds.